It's Not Work, It's Gardening! : Another bird rescue! I happened to look out the front window yesterday at just the time that my neighbor's son-in-law was doing something strange in their yard. What it looked like to me was that he had just hung something from the lowest branch of one of their huge pine trees. A sachel, a bundle of burlap. Perhaps something to help discourage deer, as it was hanging a few feet above some new hostas. It was still swinging slightly, which gave me the impression that he had just put it there. My first thought was negative, that whatever it was would never ward off those trespassing herbivores. My curiosity got the better of my though, and I grabbed the binoculars to get a better look at the dangling bundle. As I brought the thing into focus, it moved! "It's a robin!" I yelled. "It's hanging from a string!" It was trying to fly away, and probably had been for some time -- it appeared to be getting quite tired, as it was hanging still more than it was flapping. Just then the son-in-law came back out wearing some gloves. I quickly grabbed a blanket and some scissors to assist, and I got out there as he was trying to decide what exactly he was going to do. "I think you'll need a little help" I said as I walked up. "Thanks" he replied, "I'm not sure what to do." It was clear that about the only thing that one person could do was cut the string that was tethering this bird to the tree. It was equally clear that this would not be the ideal situation, because the bird would still have a length of string tied to its foot. In a quiet moment of resting for the bird I wrapped the blanket around it, restricting its flapping and any other movement. 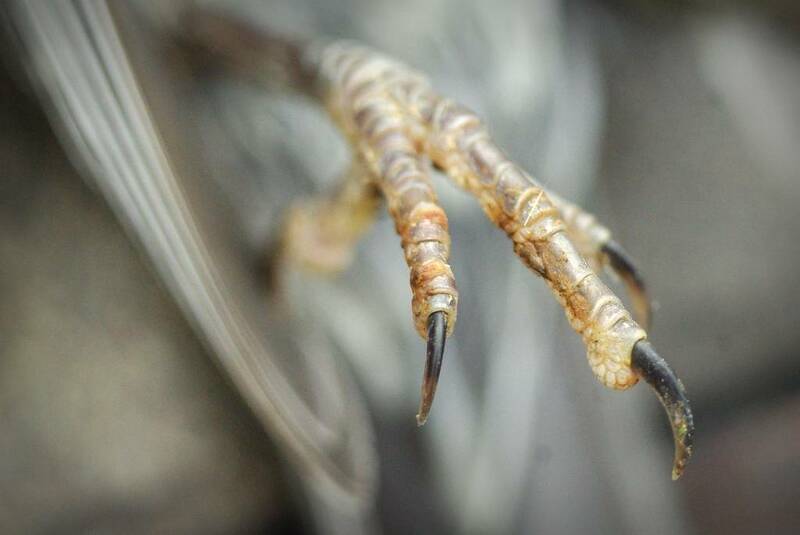 This gave us a good view of its feet, and it was clear that the string had to be removed, as it was wrapped many times around and had been pulled tight by the bird's struggles. A quick reintroduction (as we had only met once a couple of years ago) and Joshua got started by cutting any loops that he could see. First the loose ones, but then the tighter coils as he got more confidence. We took things slowly, not wanting to cause any more pain by being careless. After several minutes the bird struggled a little which made me have to reposition my grip, and we decided to switch roles. He had cut everything he could see from his side of the bird and my arms were getting stiff from not moving, so he gently grabbed the blanket and I took out my own scissors; his were quite dull. A few more snips, some careful teasing of knots, and the foot was finally free! Neither of us are experts in avian podiatry but we could see that there was some injury to the foot. It looked a little misshapen, and there appeared to be a little bit of a cut where the first loop of string tightened. After agreeing that there was nothing more we could do, Joshua put the blanket onto the ground and carefully uncovered the robin, who paused for a moment and flew right up onto a tree branch high overhead. I wasn't entirely sure, but it looked like it tried to land on both legs but the injured one didn't work quite right. The last thing we did was cut the remaining string remnants from the pine tree. "It pooped on your blanket a little" Joshua said as he gingerly handed it back to me. "It doesn't matter in the least" I replied, smiles on both of our faces after a successful rescue. Remember the bird I rescued from inside the porch post? This was quite a bit easier than that. They can get caught up in some stuff with all the trash there is. I'm seeing more and more plastics in bird nest than before. Maybe they realize it lasts longer than twigs. Good story with a contented ending. I do wonder though about the string, was it on the tree or did the robin bring it in? Loree: the string appeared to be in the tree already, but maybe it was the bird that put it there (intentionally or not).